From Yolele to Le Grand Dakar to … Julia Child? Pierre Thiam, owner of Le Grand Dakar in Clinton Hill, has turned his Senegalese heritage into an opportunity to win a Julia Child award. Like most African immigrants, Pierre Thiam, owner and chef of Clinton Hill’s Le Grand Dakar, arrived in New York to attend college. That was 20 years ago. And while he has since left the studies behind and made his permanent home in Clinton Hill, he has never let go of his Senegalese roots — so much so that Mr. Thiam, or Gorgui as his family calls him, has taken the skills he learned as a youth and used them to make a significant contribution to American cuisine. His first cookbook ‘Yolele! Recipes from the heart of Senegal’ was recently nominated for the coveted Julia Child Award from the International Association of Culinary Professionals, making it to the final three out of 400 tomes. “I didn’t even think about being a finalist, the dream was to be published,” said Mr. Thiam, 44. Because it is the women in Africa who are in charge of cooking — and it was mothers, aunts, sisters and cousins who passed on their tricks to Mr. Thiam, and who are shown preparing the recipes in the book — Mr. Thiam said there are others who share the credit. “It’s a tribute to all the women in my family,” he said. After working at SoHo hotspots Jean Claude, Boom and, later, the defunct Two Rooms, where he attracted notice for his infusion of African dishes into the menus, Mr. Thiam set up shop in Brooklyn. 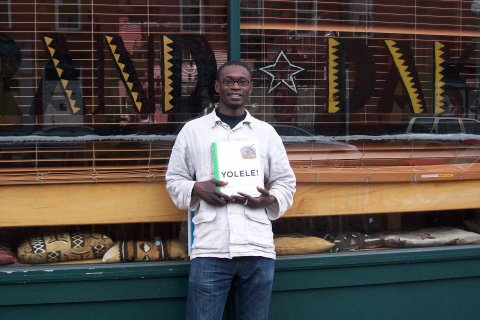 His restaurant, Yolele, in Bed-Stuy, was instrumental in making the area a new hub for African cuisine. Five years ago, he opened Le Grand Dakar in Clinton Hill, a stone throw from the home where he’s been raising three children for the past 14 years. Yolele has since closed. But Le Grand Dakar, with its 1,000-square-foot space and seating for 75, has evolved into a cultural hub. Mr. Thiam’s food is the draw, but on Tuesdays and Thursdays diners are treated to jazz. Last week Bill Lee, father of Fort Greene’s own Spike Lee, jammed all night. Afrobeat maestro Jojo-Kuo is headed there later this month. “The idea was to bring an African village outside,” he said of the decision to have African fashion shows, a stage with drummers and more outside Le Grand Dakar every summer. Mr. Thiam, though, might have something to celebrate much sooner: On April 4, while Senegal is commemorating 49 years of independence from the French, he will be in Colorado where he has a chance to win the Julia Child award. 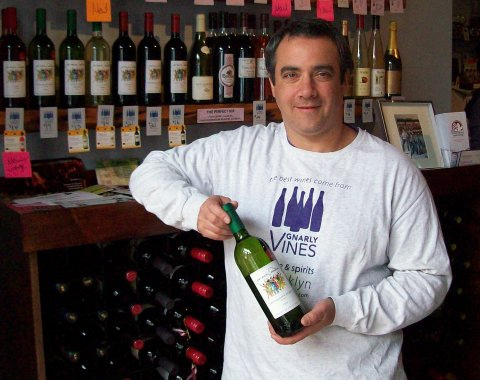 Brian Robinson, owner of Gnarly Vines, has turned his wine shop into an art gallery. There’s never been a shortage of liquor stores in Fort Greene or Clinton Hill. These days there’s a fair number of places to buy fine wines, too. One shop that opened about 16 months ago, Gnarly Vines, has figured out a way to do more than keep the wine — and people — coming. The owner, Brian Robinson, has also turned the place into a gallery, where he displays local works of art. So far 10 exhibits have been up in the shop at 350 Myrtle near Adelphi. And tomorrow a new exhibit goes up, this one by the Fort Greene Photography Organization, a group of amateur and professional photographers. “It’s Women’s History Month and I wanted a theme that reflects that,” said Ocean Morisset, the founder of the Fort Greene Photography Organization. How Gnarly Vines came to be the site of a gallery is a tale of shrewd marketing and opportunity. The area already had several wine shops, including the Greene Grape, on a corner of busy Fulton Street, and Thirst, which opened on a discreet corner on DeKalb Avenue, just steps away from Fort Greene Park. Gnarly Vines took up a cavernous space on Myrtle Avenue, right across from a liquor store. Mr. Robinson, 42, said he was surprised by the response. “I didn’t think there would be that much foot traffic on Myrtle Avenue,” he said. “I thought the store would be kind of dead and I would have to make a living by calling up people, by building up a client list of contacts that I would be delivering cases of wine to in Manhattan and Brooklyn, and throughout the five boroughs. In fact, there always seem to be folks milling in and out of the 20-by-77 square foot shop, giving it an arty SoHo gallery vibe. The shop also offers complimentary tastings of neighborhood cuisine, donated by local restaurants. “She” will include works by 12 of the Fort Greene Photography Organization’s 14 members. They feature female spirits, young girls and beautiful women, and will be on display for the next few weeks. On the west side of South Elliott Place, it’s Elliot with one T — wrong! On the east side, it has two T’s — correct! Forgive the residents of South Elliott Place if they have been having an identity crisis. They have wondered for months why all the signs on their street are different. On the east side, the signs are spelled with two Ts. On the west side, one T rules. “It’s just embarrassing,” one resident said. Another called the city’s Department of Transportation months ago but the signs, which mark the two blocks from Dekalb to Fulton, remained. Several inquiries from The Local have brought the promise of change. The wrong signs will come down, but it’s unclear when the replacements will be put up. “The correct spelling is S. Elliott Pl. Four signs will be removed Friday, March 6, and replaced soon thereafter,” DOT spokesman Scott Gastel said in a recent e-mail. Given that it takes months to make new signs, residents may have to live without signs on one side of the street for some time. BTW, Elliott Place is named for Henry Elliott, a wealthy 19th century shoe merchant.